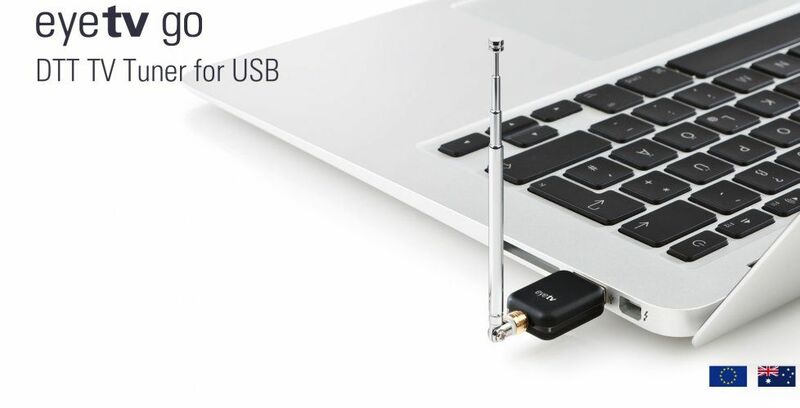 Watch, record, edit, and enjoy TV on a Mac or PC with eyetv go, an incredibly tiny digital TV tuner. eyetv go delivers powerful DVB-T (DTT or Freeview) reception, cutting-edge technology, clean design, and extreme portability in one diminutive device. Barely larger than a USB connector, eyetv go is a perfect fit for any Mac or PC. eyetv go slips easily into the USB port without blocking other devices. Despite its extraordinary size, eyetv go is a powerful digital TV tuner that delivers full-size, crystal-clear reception and uncompromising quality. In areas in which high-definition television is broadcast via DVB-T, experience stunning 720p or 1080iHDTV, in MPEG-2 and H.264/AVC. eyetv go has one quality setting, Lossless. The DVB stream is recorded unaltered to give you the full quality MPEG-2/H.264 file as encoded by the broadcaster. EyeTV supports DVB-T multilingual programming and Dolby® Digital sound. Beautifully designed, eyetv go comes with a variety of options for aerial reception. The miniature telescopic aerial attaches neatly to the end of the TV stick without wires or cables, and a larger portable rod antenna is also included as an alternative. eyetv go’s included telescopic aerial and rod antenna are primarily intended for use in areas in which DVB-T broadcasting stations emit enough power for portable DVB-T reception. If necessary, the included IEC-MCX adapter may also be used to connect any type of active aerial that has an independent power source, or with a passive aerial such as a rooftop aerial. eyetv 3 software offers special features for Mac users, including Smart Series Guides, Smart Playlists, automatic exports to iTunes, and support for the eyetv for iPhone app. You can use eyetv go with a Mac or PC. eyetv go is compatible with Windows 7 or later and includes the Total TV Player software for Windows, which supports many of the same features as eyetv 3. Please download the Windows driver here! Internet connection required to download eyetv 3 / THC / Total TV Player. Freeview HD, encrypted programs and/or DVB-T2 broadcasts are not supported. The availability and amount of program information varies depending on the channel. eyetv go is intended for use in countries where digital terrestrial television is broadcast. Digital terrestrial television is also known as DVB-T, DTT, Freeview in the UK, and TNT in France. DVB-T reception can vary by location, and a rooftop aerial may be required in areas with a weak or obstructed DVB-T signal. After downloading, run the driver installation and follow the instructions. You can also update previous driver versions with this application.